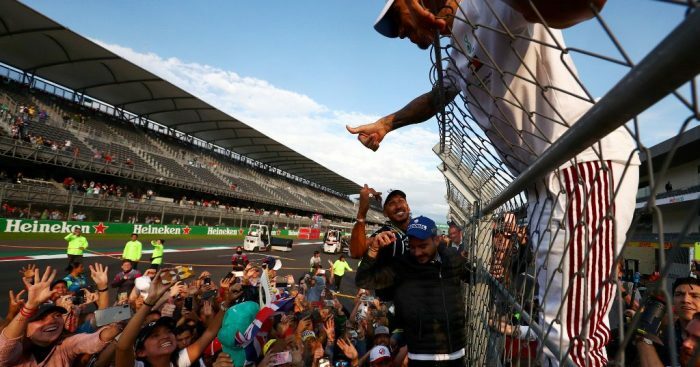 Mercedes would be happy to see Lewis Hamilton end his F1 career in Brackley but concede it depends on whether they continue to produce a title-winning car. Last time out in Mexico, Hamilton wrapped up his fifth Drivers’ title, his fourth with Mercedes. In doing so he took a step closer to Michael Schumacher’s record of seven World titles while his 71 race wins put him just 20 behind Schumacher. Hamilton is keen to “at least get close” to the German’s records with Wolff saying he hopes he will do so while driving for Mercedes. “As long as we provide a car that is competitive to win championships and he continues to drive like he does, this can be a relationship that goes forever,” the motorsport boss told Sky F1. Earlier this year Hamilton signed a two-year extension with Mercedes. Despite that rumours continue to suggest he could one day be off to Ferrari. For now, though, Hamilton says he can’t see himself moving to any other team. “At the moment, it’s very very difficult to imagine, envisage myself anywhere else,” said the Brit. “This is my family, this is where I grew up but I said the same thing when I was at McLaren. “I think one of the reasons I wanted to move was to go somewhere else and see if you could do something special somewhere else. I knew I could but I needed to prove it to everyone else.